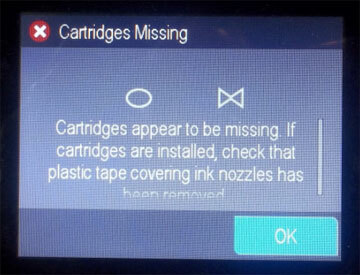 Upon installation of a refilled HP 952, 952XL & 956XL ink cartridge you may initially observe either a “Used HP Cartridges“, “Counterfeit Cartridges“ and/or “Non-genuine ink cartridge installed” alert messages. Choose ‘Yes’, ‘Continue’ and/or ‘OK’ to bypass the various nuisance alerts. This will enable normal print operations and prevent future nuisance messages from appearing. For HP 952, 952XL cartridge errors such as “Cartridge Problem”, “Missing or damaged”, “Cartridge Error”, “The following cartridges are not intended for use in this Printer”, etc. then the printer is not recognizing the cartridge’s ‘smart chip’ which is affixed to the rear side of cartridge or is not properly locking the cartridge into the printer’s PRINTHEAD assembly. 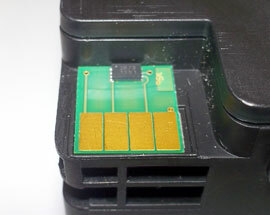 NOTE: Providing the most recent generation of smart chips were installed by your refill store, then it possible there could be ink residue on either the cartridge’s smart chip contact surface or there is a connectivity problem between the cartridge’s chip and the PRINTHEAD (inside the printer), which may be caused by a bent or broken PRINTHEAD pin. For ongoing “depleted cartridge” error alerts this might indicate the cartridges were not properly refilled with the correct ink volume. In any event, we suggest you return to your ink refiller and have them validate that new generation smart chips were installed & ask them to confirm proper cartridge refill weights. It is first suggested to remove all ink cartridges from the printer and slowly re-install each cartridge, ensuring each ‘clicks’ into place properly. 1. 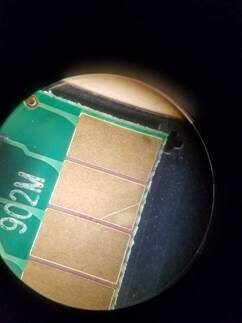 The chip has poor connectivity with the printer (i.e. possible ink residue on chip contacts – thoroughly clean chip’s surfaces with a damp towel). 2. The chip has been incorrectly placed onto the cartridge by the refiller (i.e. slipped to one side or installed upside down). 3. Cartridge alert messages may also be caused by an incorrect chip version installation (i.e. yellow chip placed onto a black ink cartridge, etc.) or the chip is incompatible with your printer model. You can ask your refiller to verify chip positioning and that the correct chip type and color were installed. 4. If the cartridge error still cannot be resolved then carefully inspect the cartridge’s chip for mis-alignment or scratches on the chip surface (i.e. refer to example scratch shown in chip below). If this condition is present we suggest you return the suspect cartridge to your ink refiller for chip evaluation and/or replacement. If you have already returned to your refill store and received a 2nd replacement chip on ALL REFILLED INK CARTRIDGES, but the problem persists, then there are additional causes for this type of failure. See below. 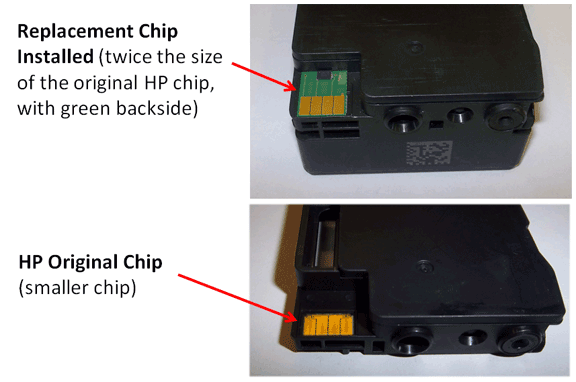 The internal built-in PRINTHEAD may have bent or damaged contact pins (the ink cartridges plug into the PRINTHEAD). Remove ink cartridge and inspect internal PRINTHEAD contact pins for visible damage (i.e. 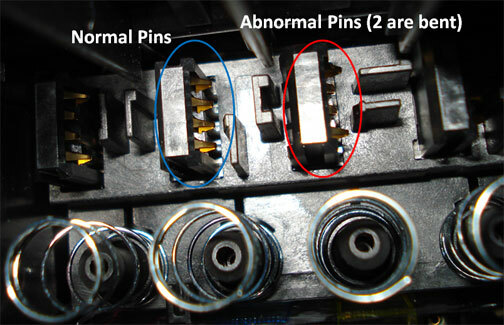 pushed in pins or broken pins – see photo below). When this problem occurs typically you will observe the error message “Missing or Damaged Cartridge”, though other ‘damaged’ messages may be observed (i.e. “Ink Cartridge Failure”, “Cartridge Damaged”, or “The following cartridges are not intended for use in this Printer”) may appear depending on your specific printer model. While the PRINTHEAD pins can be ‘carefully’ bent back into position using a very small flat head screwdriver (i.e. using eyeglass screwdriver or similar), the PRINTHEAD may need to be replaced with a new one if pin damaged is too severe. NOTE: For the best refilling experience, only use HP original/genuine ink tanks which display the HP trademark/logo. 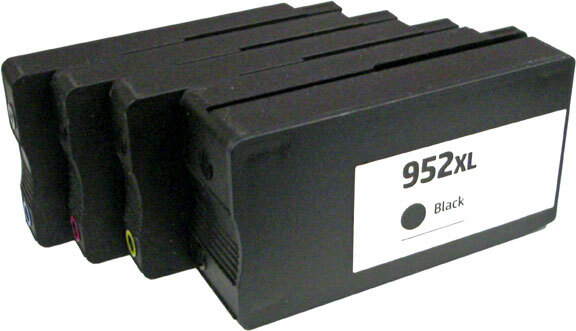 NOTE: Our Retail ink refill labs will NOT refill non-genuine HP 952, 952XL or 956XL ink tanks.